MONTREAL - Air Canada launched its regional service in rival WestJet's backyard on Friday with the introduction of Bombardier Q400 turboprops. The Montreal-based carrier said the first flights connected Calgary to Fort McMurray, Alta., Regina and Saskatoon. Nine additional routes will be added over the coming months. Air Canada (TSX:AC.B) also said it plans to increase capacity on key routes in the spring and summer by using larger aircraft, adding flights to "meet strong demand" and roll out additional turboprops to routes in British Columbia, Alberta and the Northwest Territories, stated Marcel Forget, the airline's vice-president of network planning. Capacity will be added to 18 routes involving Calgary, Edmonton and Vancouver, with some routes seeing a doubling in available seats. Capacity will also grow 24 per cent starting in May between Toronto and Fort McMurray. 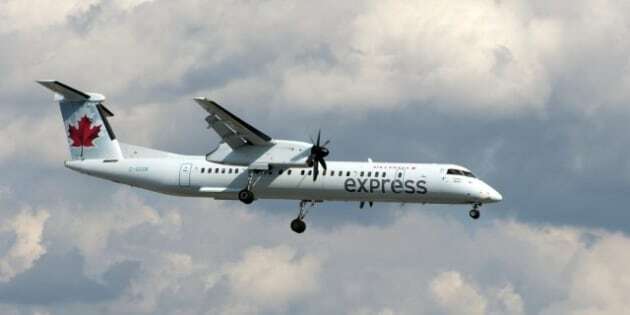 The 76-seat Q400 planes will be operated by Jazz Aviation (TSX:CHR) under the Air Canada Express brand and replace 50-seat CRJ100/200 jets. Calgary-based WestJet (TSX:WJA) was slated to announce in January its own regional service plans using the Q400 turboprops but that has been delayed until sometime in February. The company reports its quarterly results Feb. 6. WestJet Encore will initially service either eastern or western routes starting in the second half of 2013, followed nine months later by the other half of the country. It expects to add up to 45 Q400s over five years. WestJet president Gregg Saretsky has said the service will reduce airfares on regional routes by about half of the full fare. Air Canada has vowed to respond to lower fares promised by WestJet with its new regional service. Meanwhile, the airline's low-cost carrier has begun hiring the first 150 flight attendants based in Toronto for the July 1 launch of service to Europe and the Caribbean. Air Canada Rouge will begin operations with two Boeing 767-300ER and two Airbus A319 aircraft that will be released from Air Canada's mainline fleet. Additional planes will be added as Air Canada starts to take delivery of new Boeing 787 Dreamliner aircraft in 2014, ramping up to 50 planes. Timing of the Boeing 787 deliveries have been questioned because of a suspected battery problem that has grounded the worldwide fleet. The discount airline will start with flights from Toronto to Venice, Italy and Edinburgh, Scotland — two destinations that currently aren't served by Air Canada, and will serve Athens, Greece from Toronto and Montreal. Air Canada's existing flights to Cuba, the Dominican Republican, Jamaica and Costa Rica will be flown by the discount carrier from Toronto. On the Toronto Stock Exchange, Air Canada's shares gained three cents to close at $2.47 in Friday trading, while WestJet was up 74 cents or 3.46 per cent, to $22.10.